Gin consists of neutral spirits or re-distilled with juniper berries and other aromatics. It is a product of precise quality control; and secret, complex recipes. The center of the modern gin distillery or rectifier is the lab where the herbs, seeds, berries and roots for every botanical charge are measured for flavor strength. This alone, makes gin highly dependent on the skills of the distiller for its flavor. 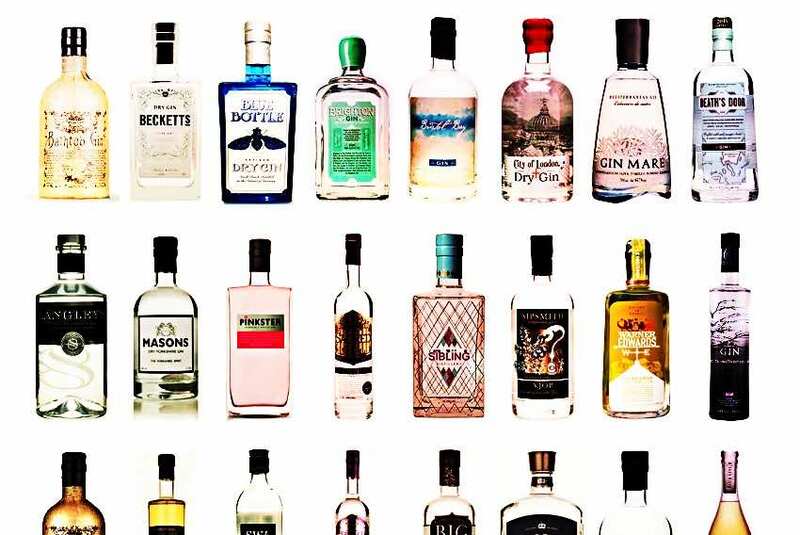 Gin is a product obtained by original distillation from mash, or by re-distillation of distilled spirits or by mixing neutral spirits, with or over juniper berries and other aromatics, or with or over extracts derived from infusions, percolation or maceration of such materials. Gin produce by distillation may be further designated as distilled, of which London Dry Gin is by far the leading type on the market. Federal definitions acknowledge the existence of a number of gins, but define only two types - distilled gin and compound gin. The distillation of juniper berries with spirits had its beginning in Holland. The drink was called Genevre, a French word meaning juniper. The English shortened the name to gin. Holland gin has a low proof malt spirit base and as result is heavier bodied than the more popular dry gin. Of the two processes that mixes gin, practically all leading brands are distilled gin. Compound gin is a simple process that mixes neutral spirits with juniper, while there are two ways of making distilled gin: direct distillation and re-distillation. Direct distillation a fermented grain mash is pumped into a still. Heat is applied and the spirit vapors rise through the still and through a gin head at the top of the still. Prior to the start of the distilling process, this gin head is packed with juniper berries and herbs, and as the spirit vapors pass through these flavoring agents, if extracts the flavoring from them. This delicately flavored vapor is then condensed and the resulting liquid is finished gin . This is known by the government as original distillation, but the alternate method re-distillation is virtually the same. The difference is that in re-distillation the fermented mash is first distilled into a flavorless neutral spirit and in turn placed in a second still containg a gin head packed with flavoring materials and the spirit is redistilled or vaporized with he vapors passing through the gin head and absorbing the flavors. To make a quality gin, regardless of the process used, the producers must start with a high neutral spirit that is clean and free from any foreign flavor. The juniper and other botanicals must also be of the best grades. Every gin producer has their own recipe. The use and proportion of any botanicals is left to the producer and the character and the quality of the gin will depend to a great extent, on the skill of the craftsman in formulating the recipe. Virtually all gin on the market use the word “dry” as descriptive of the brand, (dry, extra dry gin, very dry gin, London dry gin, English dry gin), but they all express the same meaning lacking in sweetness and in any pronounced aromatic flavor or bouquet although the tern London dry gin originally was applied to gin produce near become generic, and therefore usable by American-made gins. The two important factors that make the difference between American and English gin is, first, the fact that English gin is distilled at a slightly lower proof than American thus the English product retains more of the character of the grains used .Even though the distilling proof of English gin is less, the bottling proof is generally higher. The other factor is the water. The difference in water influences the character of the fermented mash and the spirits distilled from it. English gin, which is accountable for the dramatic rise in imported gin popularity, is made from a grain formula of 75 percent corn, 15 percent barley malt and 10 percent other grains, and is distilled at a lower proof than the domestic product. This formula accounts for a basic differenced from American gin under U.S. regulation neutral spirits specified grain spirits commonly used. In English gin, making the fermentation process is similar to whiskey after fermentation a column is still used to distill and rectify the wort resulting in a pure spirit of 180 to 188 proof . The spirit is reduce to 120 proof with distilled water. Using a gin or pot still producers re-distill the reduced spirit using juniper berries as the primary flavoring agent. Various botanicals are also used for flavoring contributions. Each distiller maintains his own secret formula.